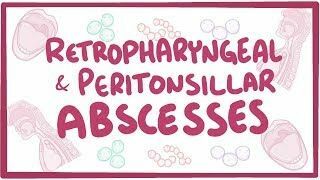 Osmosis: Retropharyngeal and peritonsillar abscesses. (2019, April 24). Retrieved from (https://www.osmosis.org/learn/Retropharyngeal_and_peritonsillar_abscesses). Retropharyngeal abscess is an abscess located in the tissues in the back of the throat behind the posterior pharyngeal wall, which is the retropharyngeal space. Retropharyngeal abscesses are relatively uncommon, and therefore may not receive early diagnosis in children presenting with stiff neck, malaise, difficulty swallowing, or other associated symptoms. The parapharyngeal space communicates with the retropharyngeal space and an infection of retropharyngeal space can pass down behind the esophagus into the mediastinum. Peritonsillar abscess, also known as quinsy, is a recognized complication of tonsillitis and consists of a collection of pus beside the tonsil in what is referred to as peritonsillar space. Peritonsillar infections are generally preceded by tonsillitis or pharyngitis, and progresses from cellulitis to .